Friday night PvP was a little different! Firstly, we had someone come along that never comes along... SPOON. Yes, you heard correctly, SPOON. Spoon has been asking to PvP, and you know how he is. It's hard to know if he's trolling or being serious, so most of the time I ignore him, because he's usually making fun of me PvPing. Anyway, I was with Pancake the other day and Spoon said he wanted to PvP so we took him for arena. We won that game, but after that he was pooped. Or so I thought. At least he went out a winner. You know I always play until I lose. 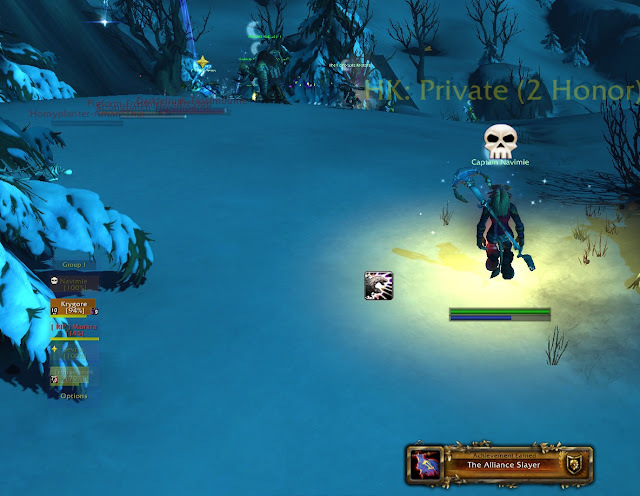 So Friday PvP comes around and I group up with Krygore and Morkra had been more interested in PvP lately, so we said hey let's go do some arena. So Morkra got on his rogue and as we were about to queue, Sev got on. Well, now we can go do our BG runs and world pvp kills in Drustvar instead! And then along comes Spoon, and so we went off to Drustvar altogether to get us some alliance. The usual hunting grounds were ripe - Champions World quests was full of people, and there was an assassin there too which I missed out on. Anyway, there were tons of horde around so we killed soem alliance and then as things turned against us, our BG popped so we escaped. Phew. When we came back there were not as many alliance around so we went around killing them, and then suddenly I got assassin and I was like uh oh, I don't want to be out here in the open so I high-tailed it back to camp. Hopefully the guards will help a bit. Poor Sev got left behind a bit and died and yelled at me, but I'm the one they wanted to kill, not him! If I was down there I'd be dead! I made it back to camp, and the NPCs didn't seem to do much, but I had a rogue and a warrior on me and somehow I managed to live, thanks to my party mates! Then the guards decided to do some work and knocked them around. There were a lot of people down the hill from the base. I just dotted them and watched everyone else do the work and then BAM! Alliance Slayer!